Jordan Peele takes us on a trip down the rabbit hole with his second feature film directorial project, Us. Get Out introduced the talented actor/producer/writer as a force to be reckoned with behind the camera, and Us solidifies his place as one of the most impressive storytellers to emerge in recent years. Zora (Shahadi Wright Joseph), a typical teen glued to her phone, and youngest son Jason (Evan Alex) complete the family unit. Adelaide’s unease while at the Santa Cruz beach and its nearby amusement park puts a damper of sorts on the family’s visit with their friends, the Tylers (played by Elisabeth Moss, Tim Heidecker, Cali Sheldon, and Noelle Sheldon). Adelaide’s spidey sense has been ramping up from tingles to jolts, and she’s certain the town’s horrifying secrets are soon to be revealed. Adelaide’s premonition of impending violence proves correct when four creepy strangers show up in the driveway on the second night of the family’s vacation. These bizarre strangers stand there, mute, staring at the home as Gabe – who’s a pretty wimpy dude considering his physical appearance and the fact he has two young children to protect – attempts to make contact. What follows that initial introduction of the creepy family clad in matching red jumpsuits is unexpected and terrifying. These intruders are doppelgängers of the Wilson family in appearance, but not in personality or intelligence. These are insane and twisted versions of the Wilsons and their invasion of Adelaide’s childhood home quickly escalates into a life and death battle. Both Get Out and Us avoided horror film tropes and for the most part avoided the use of jump scares. Peele doesn’t freak out the audience by serving up blood and guts, although there is plenty of action and violence. Instead of gore, his Us plays on our fears that something evil might well lurk deep inside us. 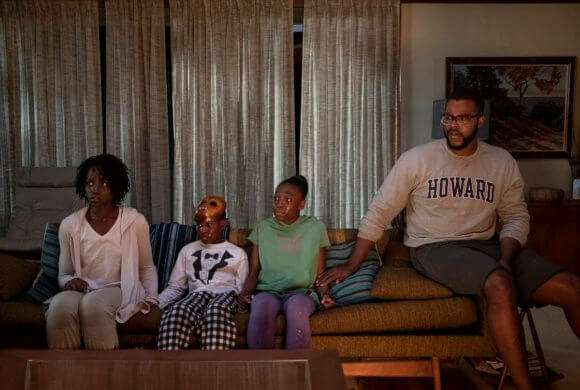 Jordan Peele’s twisted psychological horror film features a terrific cast led by Lupita Nyong’o. Nyong’o delivers an award-worthy performance as both a fierce mama bear and her homicidal doppelgänger. The incredible range on display as Nyong’o brings both characters – one intense and relatable, the other a warped fun-house version of a mother – is phenomenal, and it’s Nyong’o who keeps you engaged throughout the weirdness that is Us. Winston Duke provides the film its few much-needed moments of levity, playing a bumbling good guy ill-prepared for this slide into a Twilight Zone-ish nightmare. Shahadi Wright Joseph and Evan Alex also do terrific work as they pull double duty playing normal kids on vacation as well as their depraved doppelgängers. The lighting, sets, and score help amp up the level of fear and dread as the family’s lives spiral out of control. In a particular stroke of genius, Peele selected the Beach Boys’ “Good Vibrations” followed by N.W.A.’s “**ck Tha Police” to cap off particularly harrowing death scenes. The ending of Us might not be perfect, but the acts leading up to it are comparable to the best of Peele’s Get Out. Us is surprisingly thought-provoking for the genre and a film you’re likely to think about in your sleepless hours of the night.